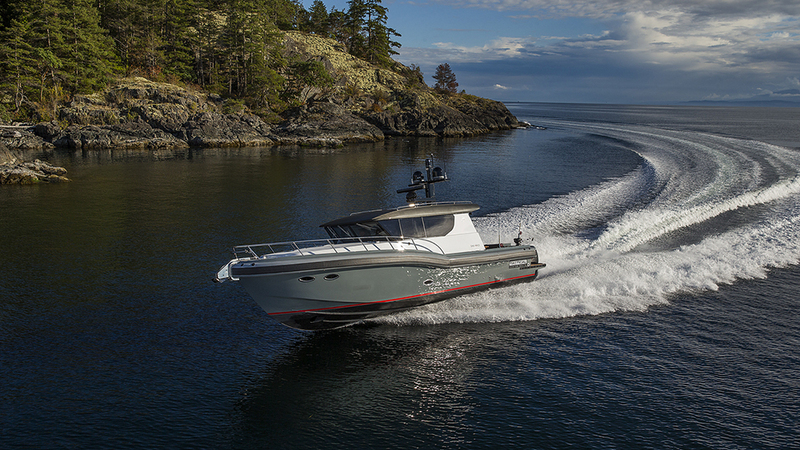 The first T-40 Super Adventure from Tactical Custom Boats has been delivered to its owner in the Pacific Northwest. The 12-metre is an unusual amalgam of aluminium hull, luxurious interior, and outboard power. Designed by Gregory C. Marshall Naval Architect, the Victoria–based designer known for offshore explorers and superyachts, the all-weather T-40 is ideal for an owner who wants to venture far off the grid into Alaska fjords or up the Maine coastline where ports of call can be few and far between. The boat’s twin Seven Marine 468kW outboard engines not only allowed Marshall to design more space into the cockpit, but also are ideal for transiting shallower waters. Plus, that much horsepower gives the boat a fast, efficient cruise speed of 65km/h. The superyacht heritage of Tactical, part of Platinum Marine, which also owns Crescent Yachts, shows in this model. 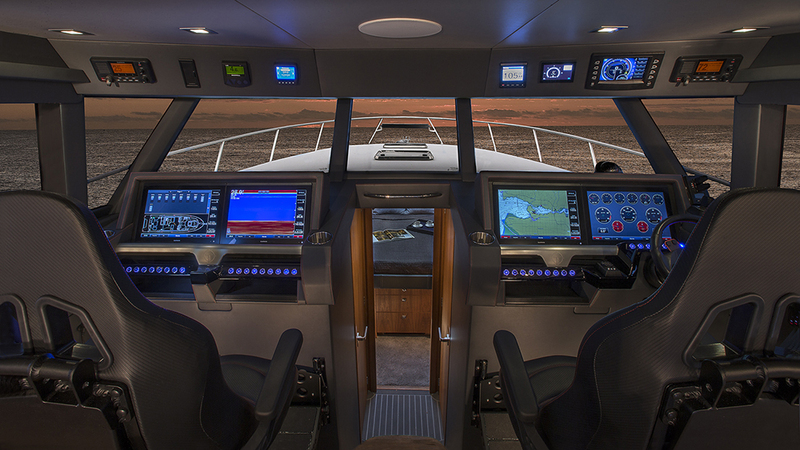 Its list of standard features is impressive: Seakeeper gyro-stabilisers, a glass helm console with wireless controls, three joystick stations for thruster control in tight docking situations, and four C-3 Shockwave suspension seats to make rough-water running a much more comfortable experience. It also has a foam collar, reminiscent of many performance rigid-inflatable boats, for increased protection. Throw in the powered sunroof, aft bulkhead window, and fully opening rear doors, and you have a boat that is ready for warm, sunny days or offshore runs in rainy weather. 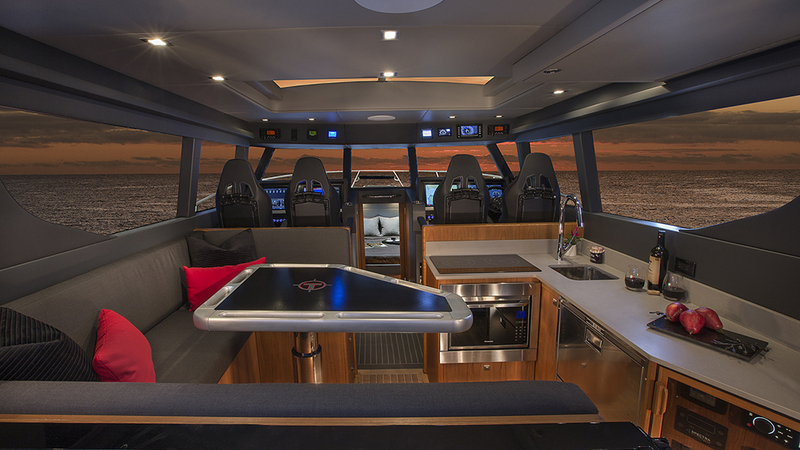 The upper area has the windshield reminiscent of a pilothouse on a much larger commercial vessel, while the aft saloon and dining areas have the same levels of fit and finish in the hardwoods and metals that one might expect from a superyacht. Marshall designed the enclosed upper area to feel spacious, including excellent headroom, without making it look too tall in profile. Belowdecks houses the master stateroom with a queen-size bed, twin hanging lockers, and a separate bathroom and shower. The boat has an optional single bunk aft. The T-40 won’t be every cruiser’s cup of tea, but it ticks all the boxes for quality and design for someone who wants a small, go-anywhere boat. It’s an innovative alternative to most traditional fiberglass, inboard cruisers in the same size range. The outboard power, hardy aluminum hull, and spacious pilothouse set it apart. Hull number two is under construction at the Platinum facility in Richmond, Vancouver.